Listed below is my personal Allaire / Dallaire genealogy. I am a descendant of the immigrant Charles Allaire, who with his older brother Jean left Poitou, France in 1658 and sailed to the New World (New France) onboard a ship called Le Tareau (The Bull). They arrived on Tuesday August 6, 1658, where they settled on the Isle of Orleans, south of Québec City in the St. Lawrence River. Their descendents have since multiplied throughout the North American continent. Married - Perrine Fleurisson, January 24, 1628/29 at St-Philbert du Pont Charrault, Poitou, France. Married -Catherine Fiebvre, November 10, 1663 at Par. Notre-Dame, Québec. Married - Marie Bidet, December 19, 1691 at Saint-Jean, Ile dé Orleáns, Montmorency, Québec. Married - Marie Angélique Cloutier, May 29, 1724 at Château-Richer, Montmorency, Québec. Married - Marie-Anne Delage, Nov 20, 1754 at Saint-Jean, Ile dé Orleáns, Montmorency, Québec. Married - Madeleine Bilodeau, October 03, 1785 at Ile-aux-Coudres, Charlevoix, Québec. Married - Monique Harvey, February 20, 1821 at Ile-aux-Coudres, Charlevoix, Québec. Married - Marie Savard, April 13, 1863 at Par. Ste-Anne, Chicoutimi-Nord, Chicoutimi, Québec. Married - Marie Eugenie Déziel, October 21, 1902 at Mistassini, Roberval, Lac Saint Jean, Québec. Married - Yvonne Laporte, 1947 at Par. Annunciation, Stoney Point, Ontario. (Our Lord of Mercy Catholic Church) - San José, Costa Rica, C.A. Some personal information on persons still living has been withheld for privacy reasons. Bissonnette , Beaune , Deziel , Laporte. Help us identify the persons in these old photos? Avis de recherche, Si vous pouvez identifier les personnages sur ces photos? Have a question or comment on your Allaire/Dallaire genealogy? View the Allaire/Dallaire Genealogy Forum Here! Visiter la Genealogie Allaire/Dallaire forum de discussion, ici! Please View and Sign my Guest Book! Je vous invite de regarder et signer mon Livre de Visiteurs! Toronto Public Reference Library (call # 929.2 A48 A482) and the Société de généalogie du Saguenay. and the Newberry Library of Chicago (call # CS90 .A53 1979). Disponible maintenant sur ce site! Use "Google" to help you translate any documents or web pages! Utiliser "Google" pour vous aider a traduire aucun documents ou pages d'enchaînement! Utilice "Google" para traducir cualquier documento o pagina de la web! *Please e-mail me if you would like your web site listed here! Thanks. "Your Name - A Poem by Edgar A. 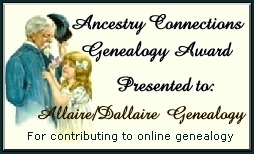 Guest"
"My Allaire/Dallaire Genealogy" web site! "Les Familles Allaire et Dallaire" (Québec 1962). Every effort has been made to correct & verify all data found on my web site. However some of my data has come from secondary sources and may contain errors. Always use data from the internet as a clue as to where to go to obtain primary data such as church records, birth/marriage certificates, etc. If you know of any errors or missing information, please e-mail me.